For the second straight year, Topps was experimental with its hockey set in 1981-82, using a regional concept. 1981-82 O-Pee-Chee once again resisted the urge to follow along with its own issue, preferring to stick to a traditional distribution norm even as it once again shared a front and back design. 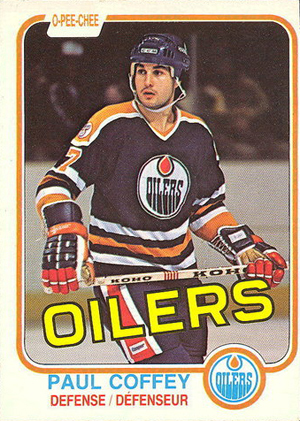 The 1981-82 O-Pee-Chee set also marked the first appearance of the OPC logo as part of the card's design. The logo is in the upper left corner on the front, as part of the solid-colored border around the photo that makes up most of the card. The player's team name is superimposed in block letters over the photo. The team logo appears in the lower right corner, with the player's name and position filling out the bottom area. The backs are vertically oriented, printed in both English and French and broken down into boxed sections. The top box features the card number inside a puck graphic, along with the player's name, team and position. Vital stats appear in the next box, and then the player's year-by-year statistics and a short biography. A note at the bottom gives a highlight of the player's career. Since the 1981-82 O-Pee-Chee Hockey set broke the numbering sequence used by Topps, the players shared by both companies have different numbers. The cards are broken down numerically by team. Teams are organized alphabetically by city. The last card in each team's subset features their scoring leader. There are also several Super Action cards for certain players scattered through the set. Cards 379 through 381 are checklist cards, and cards 382 through 396 spotlight statistical leaders and record-setters from the previous year. Several rookies are featured in the 1981-82 O-Pee-Chee Hockey set. These include Jarri Kurri, Paul Coffey, Glenn Anderson, Don Beaupre, Dino Ciccarelli, Dale Hunter, Tim Kerr, Rejean Lemelin, Kevin Lowe, Andy Moog, Larry Murphy, Denis Savard and Peter Stastny.